What’s Missing from Today’s Storage Cloud Solutions? Whether you are an organization looking to develop a private or hybrid storage cloud, or a service provider focusing on developing a public storage cloud – there are some requirements that are not negotiable. Storage clouds are more than thin provisioning and virtualization. There are a number of key requirements that must be implemented in order to store extraordinary numbers of objects of any size or type and process a massive number of requests on a global basis in a high availability design with no single point of failure. - What are the key services needed to deliver a storage cloud? - What key requirements do “cloud solutions” from traditional storage suppliers fail to address? - What services are missing from most storage cloud offerings today? 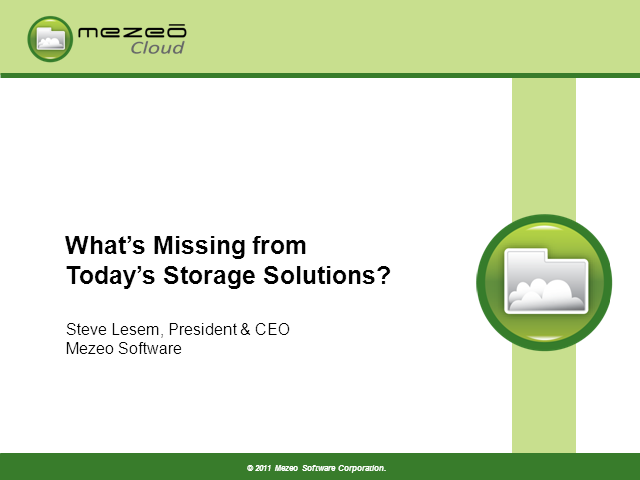 Title: What’s Missing from Today’s Storage Cloud Solutions?